It is a very interesting phenomenon that one observes. Especially in times of social media and self expression and where everyone’s a publisher. That there is a reasonably strong feel amongst the educated Indians, that corruption is not good for the country and that politicians and others who are resorting to these means, must be punished. But when there are efforts from _someone_ or _anyone_ to do something about this menace, there are objections raised. It happened when Anna Hazare protested. It is happening now even as Arvind Kejriwal exposes one scam after another. There is a disagreement on the methods being adopted. And hence a disagreement with the individual concerned. There was a list of people who contributed to Kejriwal’s organisation, which was published. And no sooner was that done, there were a fair bit of disclaimers and denials that came out from the people named therein. Because they did not want to be associated with the means that Kejriwal was adopting. Besides those few whose names came out as contributors to Kejriwal, many others all over Twitter and Facebook also found objections to his means (like they’d found in Anna Hazare too). Arm chair activism in full flow. With strong arguments as well. “Yes, I am sitting in my arm chair. Yes, I hate those reports about large sized scams, politicians and other heavyweights getting away scot free. Yes, I wish there was a solution. Yes, I am happy that someone is making some noise and trying to do something about it. But hey.. No, I don’t agree with THAT particular thing that he just said or did. Do you have another plan? Do you think sitting in your armchair and wishing for that perfect solution will make it happen? Do you even have a paper concept of that perfect solution?? Do you know what it takes?? And yet, you will keep finding faults when someone is doing something. So I take it that you don’t really care about the problem as much. And you are fine with the fact that we are becoming an increasingly corrupt society, and our children will not be able to make any headway in life, without needing to pay their way through. You are willing to accept that reality for tomorrow. Is it?? Or is it not? If not, then what are you really doing about it, except for finding faults with someone who is making an attempt? Are you are part of the solution or a part of the problem?? e. That’s fine. Once you contribute (time, money, support) to a broad cause, stay with that. Does not matter if some of the means are not the perfect ones that you’d have liked to be adopted. f. If you do not agree and cannot support, and would like things to happen in a certain way, what choice do you have? Heck, go out and do it yourself. Become an activist and walk YOUR talk. g. Because there is no other way. This is NOT Burger King. You CAN’T have it your way otherwise!! You cannot order “a custom-made NGO that will do exactly what I want it to do” or “a new political party that will obey my every command”. I know that I am unable to be on the street, fighting the corruption war, in a way that I would like to. 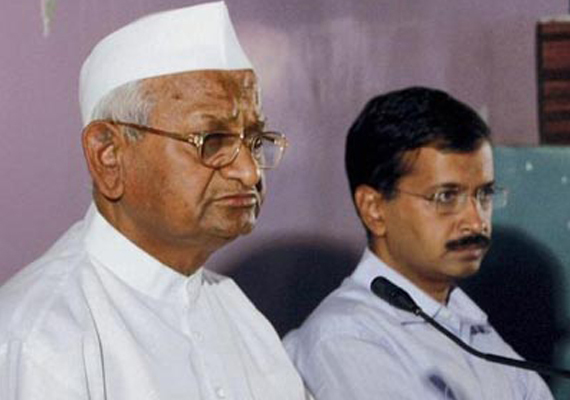 So I am happy with an Anna Hazare or an Arvind Kejriwal who are doing their part. I will support them, and wish them the best. Even if I find an odd objection in their methods. And this other absurd expectation that people have. That you should be spotlessly clean before you raise a finger against the politician for being corrupt. What nonsense that is?? I could be trapped in a system or I might have not had the courage to stand up against corruption so far. That does not mean that I don’t have or can’t have a desire to live in a corruption free society!! I did not go to check if Dale Carnegie truly knew how to make friends and influence people. In fact, I don’t know if he had any friends at all. I didn’t care. I liked the material in his book and that was enough for me. Likewise, if Kejriwal and his team have good material, I will support them. Not check if there is an odd old skeleton of sorts, in some of their cupboards’!! Please ask “Kejriwal” to question himself, when did he first start thinking that he should be alright… I am sure he would have taken a long (25-30 years) and a serious learning curve to reach to that mindset (he probably researched there without realizing about them)? There is a major problem with his understanding, and his promises seem unreal. I guess not less than 1000 times I was told since childhood one needed to follow what is appropriate. However, I don’t think I ever understood its seriousness until I realized its cause and effect out of the happenings in real life. He needs to understand the framework of human psychology. His expectations are like… making a LION stop eating other smaller animals… no matter which wise person comes and talks to the LION, would a LION be able to leave its natural needs? I appreciate his thought process and will be with anyone who is working towards the betterment but then his goals need a better approach. Again… as far he or anyone, for that matter, is attempting the right things, I guess everyone in the society should join them. I am sure it would not serve any good in the next 100 years at least. However, the future generation might evolve with better methods. Again… we are not LIONS so hopeful might evolve into becoming better humans. If I understand your analogy right, you are saying that corruption is entrenched into our system so much that you cannot stop bureaucrats or politicians from their practises and any attempt to do so, is like taking away prey from lions. I hope I have got your point right. If you are saying this, even though it may be a fact, it would seem very cynical, and almost like giving up the fight. I don’t think we have a choice to give up. It is a path of negative spiral, and giving up or letting things be, can accelerate our path to disaster. Whether Kejriwal’s the right man, or his means are the right answer or not, we do need to keep giving any such option a fair chance, and our full support, to succeed. That’s our only hope..
All those who are rationally strong will have reached a certain frame of mind would not be able to give up. They will be made to do their “karma” and this process would probably go on. No one will give up their duties. This will keep the “negative spiral” always in a balance. The problem with lesser intelligent people is they would not stop thinking their method of looting being wrong. They might think “we served for this society and should we not gallop an Adarsh flat at-least? Nobody will come forward when we need a justice.” This sort of thinking is a rational approach which a human of lower intellect takes. Let’s take an example… To earn money out of interest is “forbidden.” I have had detailed debates with both western and eastern philosophers regarding its justification, and everyone’s conscience with this matter reached a logical agreement… What if interest is to be given up, and it reaches a legal agreement some day? “Interest” is nothing but white-collared looting. Both Eastern (including Hindu) and Western religious scriptures mention “interest” being inappropriate. But how many here realize all those being wrong? Who has the time to find out the ethics and morals of every step one adopts in life, rationally shouldn’t one find all of them? We only focus over matters, those that attain lot of publicity. Now, if one start showing all the steps in ones life that most think is appropriate but is highly amoral? Many wise will read and adopt them… but many would just walk away. To make things even tougher… eating most vegetarian food where the plant’s life is killed is serious offence, but how many here realize it. Rationally, it is only fruits (without killing the seed) and certain naturally available food that can be actually eaten. I am sure… most from, here would think “ignore all this.” But then there are Sadhus, who do adopt such a mode of life and follow methods which most would just dream about. The point is… human society gradually adopts maturity in a slow and steady manner. I am sure many more types of psychological illnesses would eventually disappear, but then the society in those times will notice problems even in those stages. This is a long process to attain the ultimate perfection. Kejriwal’s is one good attempt with its own flaws. While you make interesting points, the changes of acceptance in society of what’s right and what’s wrong, of the type that you refer, happens over long periods of time. We judge what’s right and wrong, by the day’s standards of law and morality. And today, we do agree that corruption is not right. By that principle, rampant existence of the same is unacceptable and unpardonable. And we need to support any efforts that aim to curb this malaise. “We judge what’s right and wrong, by the day’s standards of law and morality. And today, we do agree that corruption is not right.”… The type of corruption that we are talking about has been around us for thousands of years unchanged. Philosophers right from the Vedic times and before have been discussing it. It has wiped out civilizations even before and the hydra headed corruption still is existent (http://www.sabhlokcity.com/metaphysics/chapter3.html). Which is why I wonder if Kejriwal’s method really going to work… Even the current political system is perfect? However, there aren’t GODLY men in the society to run them… whatever system one creates… one will need to use the same people available in the society. We all wish Kejriwal lot of courage and strength… let’s see if his methods really work… Having these suggested checks are great, but it a serious change in social thinking is required. *Right now humans are trained to follow and pile money right from the childhood… that’s the root cause*, *We today grade people based on their bank balance. * That needs to change… Only then there is a little hope… But is that possible? I would look for shorter term options than an overall personal cleansing and change.. which if at all happens, will be a long, long journey. Sir, there should be no comparison between the Singapore and India. Singapore’s population is around 5,183,700 (2011, Source: World Bank) and that of India’s is around 1,241,491,960 (2011, Source: World Bank). The point here is… everyone seems to expect… upon implementing Lok Pal everything will be immediately alright, etc. While, as a matter of fact, though the bill has good parts in them, one should not expect sudden changes to happen. Alternatively, even if parts of administration go in the hands of Kejriwal, things would not happen at the very moment… which is highly possible. Nobody wants corruption around… but then everything has to happen in a slow and steady manner. There will be resistance both from critics and the corrupt… but that’s the sign of a mature society. Pure GOLD will show up only after heating and evaporating all the residues. There could be unseen flaws in Kejriwal’s framework, which would eventually get fixed with a multitude of thinking. Again, we as a society need to keep pushing whatever is good. However, that push will be critically evaluated and resisted… only for good. No, there is no overnight solution. However what seems extremely tough to pull off, is to get people one-at-a-time. To change. To be different. How does that happen?? Who makes it happen? At a large scale..? On the other hand, a leader with some kind of national appeal, and having the right ideas broadly, can have a relatively larger impact. Hence we must support, is all I am trying to say. That is NOT at the cost of changing ourselves. Which is for our own sake, more than anything else.. Does Kejiwal have a solution? He only talks about past or an ideal future but his ways have led to a receding economy with GDP falling to somewhere around 6%. Again, our expectation from Kejriwal is that he shows us the full detailed path from current stage, upto the ultimate point of the solution. While we tolerate our governing party and the current main opposition parties, who may be doing nothing and may not have a clue on tomorrow, forget the longer term?! What Kejriwal is impacting, or creating, is a sense of cleansing. It may take a certain small toll in happening. But what can potentially emerge is a cleaner space. And where business and industry can thrive. Without abuse of corruption, and on the foundation of merit. As he is impacting some industries and people who have benefited from wrongdoing, And while that happens, industry and economy will take a short term hit. The alternative is to not do anything, pretend that things are hunky dory, keep enjoying economic growth, but lead to a disaster, from where we cannot recover at all. I would rather sacrifice short term growth, for a more sustainable future! I would certainly like to check out Sanjeev Sablok. 1. While it is appreciated that other alternatives are coming up, any alternative to succeed, will need an extent of mass reach and acceptance. The concerned person/s need to mobilize support of a larger scale without which these remain interesting concepts, very very localised. In that respect, Kejriwal with his efforts and methods, has been able to generate mass reach and awareness. 2. The aspect of who’s “providing real solutions” is a matter of personal perspective and understanding. So I wouldn’t look at one being the only way and not the other. I request, please don’t read any new about kejriwal, he is pakka chore, also he wants to become no.1. in india. he wants to fool people and give bad impression about all political party, so public going to support him finally, I request all we Indians to kick him out of the country and not to waste our valuable time in this. I don’t believe this kind of crap. And just because it’s hurting some people and corporations, you want him to be shut up and thrown out of the country. Better to throw the wrongdoers out of the country, be it politicians or scamming industrialists. Dear all , It seems that we are bogged down on some ideas of our own and ready to critisise any one that wants to take one step forward. All those who are corrupt using any means to gain financial benefit but those who wants to start the process are bogged down with all the hell breaking on them. it is nice to sit and comment on any one doing anything but have introspect and see that what you your self are doing. Like Ratan Tata said that he refused to give bribe for what ever was the benefit. How many of you are ready to sacrifice that gain ? Unless we take first step how are we going to go forward. We talk of law but all the laws are created by those corrupt polititians to benefit them. SO let us stop all these discussion and do what we can our selves to stop the spread of corruption. I my self have suffered many times for not willing to give bribe but that is my way of contibuting in a small way. We all know story of walmiki and we teach our children that one there is transformation it should be respected. If KAjriwal or Anna is doing some thing and sacrificing it become our duty to support and not join crtics band wagan., it is so easy to do. Yes, each of us can do our part. However few individuals being clean, is NOT going to be a way to cleanse the country and the society. For that, we do need a bigger revolution, and for which, as you rightly suggest, we need to keep supporting causes and people, be it Kejriwal or Hazare..